Expose rip-offs and injustice. Confront the industries and politicians responsible. Change the world. 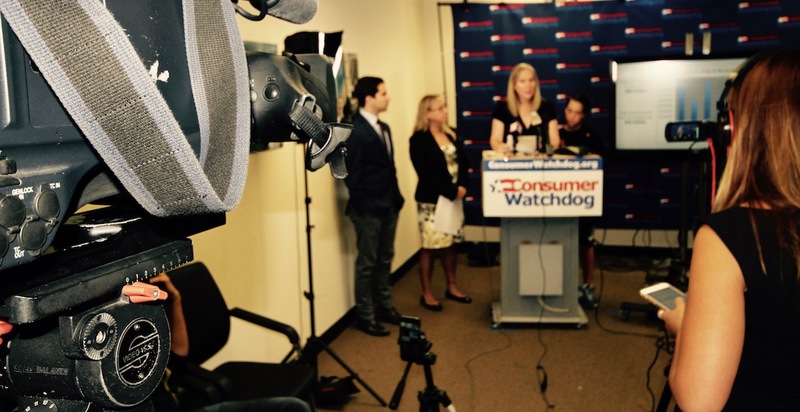 Our mantra at Consumer Watchdog is simple, but effective. Whether we’re at the Capitol, in the media, or in the courtroom, these are the strategies we use to make sure that we win justice for American consumers and taxpayers. With decades of experience researching consumer issues, corporate misbehavior and political corruption, we develop innovative solutions to some of our country’s biggest problems. Over the years our investigations have changed corporate practices, driven corrupt politicians out of office and inspired groundbreaking legislation. When push comes to shove and government doesn’t respond, we get citizens involved online and on the streets to change policy from the ground up. We help regular people tell their stories to bring major issues the national attention they deserve, and we work with policymakers, groups and and concerned citizens to get the change we need. For decades we have been a trusted voice for consumers that rises above partisan politics and special interest dealmaking. Whether submitting our analysis to a regulator, demanding action from a lawmaker or exposing an injustice to a news reporter, our unrelenting and unwavering approach to advocacy has been key to our success. We use the courtroom to win battles against large corporations that repeatedly break the law in order to rip off American consumers. Through legal and regulatory actions, we have changed corporate behavior and put billions of dollars back in the public's pocket. You can also read about some of our history by viewing this PDF of this feature produced by the team at the Sacramento News & Review.